Located on N 130th St between Ashworth Ave N and Stone Ave N, Extra Space Storage serves Seattle residents near Northwest Seattle, Shoreline, Lake City, and more. Locals will recognize our facility near Albertsons and Petsmart. Extra Space Storage on N 130th St offers a wide selection of storage units, climate-controlled storage, vehicle storage, and exceptional security. We're your ideal self storage partner in Northwest Seattle! No matter what you plan to store, our Seattle storage facility has the solution you're looking for! We have everything from small 3x5 storage lockers to large 10x40 climate-controlled units. At Extra Space Storage, we care about providing a safe storage environment. That's why our facility is equipped with advanced security measures like 24-hour video surveillance, an on-site resident manager, electronic gate access, individually-alarmed units, and security access to your floor only. Keep delicate belongings safe from extreme heat and cold with a climate-controlled unit. This feature ensures your unit stays comfortably between 55? and 80? year-round. Units with climate control are available in sizes 3x5 to 10x40. Need to store a car, motorcycle, boat, or RV in Seattle? Extra Space Storage offers 8x20 to 12x20 outdoor parking spaces that can easily accommodate vehicles of all sizes. Not only does Extra Space Storage provide high-quality self storage in a clean, secure, well-maintained facility, but we also have the best customer service in the industry! Our friendly, professional staff is always available to assist you and ensure you're satisfied with your experience. Contact us today to reserve a storage unit in Seattle! This place is in a neat condition with many options of units to rent. They have security system. The workers are friendly and helpful. The prices are reasonable. Great customer service at a great location. 3 time return customer... enough said! The staff are friendly and helpful in helping me identify what size unit i might need. They have great hours to access my stuff. It is very clean anf they have an excellent safety record. Clean, well run, helpful admin- this is a great place to store your stuff. The security and attention to detail does not go unnoticed, and is appreciated. I would recommend this storage company to anyone- they are great! Misty & Vincent are efficient, yet friendly & helpful. They keep the place VERY clean. It’s well lit, and I like that the lights are on motion sensors, so your path lights up as you head to your unit. I love the wide hallways & roll up doors so access is relatively easy, even with large pieces. I checked them out online before going to to see the units & facility, and the web-price gave them the edge over the others i was looking at. Once I actually saw the units/facility, it was a no-brained. Misty & Vince are the icing on the cake. Not sure how long I will need the storage space, but I’m pleased with my decision, and would return in a heartbeat. This facility is by far the cleanest and well maintained storage place I’ve experienced. Everything is easy access for me. And I feel safe and secure when I need to enter facility on my own. I used several self storage units. At one place, my belongings were stolen. No action taken. There were water leakages at some units. Rent is high. Parking problems. Insurance was very high. No clean environment. Sometimes I had a fear to go alone. Extra space is the best place for self storage. Employees are very friendly and very helpful to meet our needs. I have never seen such very good and commendable employess. On our move in day, there was a major issue that caused us to lose a lot of time. However the staff at Extra Space storage stepped up and handled the issue very well. Misty was incredible. Not only did she make my move in experience simple and easy, but she helped me find movers who could assist me with the process--and coordinated their schedules for me! I'm absolutely blown away by her expertise and level of service. She truly made me feel like family! One of the best places I have ever used for Storage. They are friendly and very knowable. I also love the fact that they have someone on site 24/7 which makes it easier not to have to worry about your stuff. Definitely would recommend this place to any an all that need a place to store their personal items for long or short term. Thank you so much!!!! Came into to check out and then sign up for a storage unit. Amanda R's assistance was excellent. She was knowledgeable, quick, gracious and clear. Made the process very easy. She is also a great multi-tasker (working with several different customers at once). This is my second time using this facility. my last experience was great, and I expect the same service again. Have had a unit here for several years for business. Recently due to death in family needed additional unit for storage of estate property. This was a difficult time for us but the Managers at this facility were thoughtful and compassionate. Even when we transitioned to a unit we thought was large enough then finding we needed more space, they assisted in quickly finding additional space to fit our needs nearby our existing unit. We recommend this facility and highly praise it's management team! We have two units in a Seattle-area ExtraSpace Storage facility. The managers there are knowledgeable, friendly and professional. The facility has inside, climate-controlled units that are very reasonably priced and quite near where we live - so really convenient. The place is always spotless. I have used a different storage facility near another residence we have and it does not compare with the overall value that our ExtraSpace Storage units. friendly staff, clean, secure and well-managed storage facilities. a little bit pricey though. from a returning customer. enough said! I recently upgraded my 5x7x8 unit to a 5x10x8 and the staff was so helpful. They let me borrow a lock during the transition of my stuff. I have had a unit with Extra Space Storage for nearly a year now and have always felt my stuff was safe and I was safe when on the premises. They've been efficient and helpful always. This is my 3rd time I rented space here mostly on periods of 6 months to 1year each, very convenient, not bad smells and very safe..maybe there others cheapers places, but I get what I pay..I Stuck to this guys! Excellent on all counts. I enter the building on dark, rainy evenings and have never had any problems with safety. My belongings seem very secure and the building is the cleanest I have ever encountered. This facility is clean & spacious. The employees are all very pleasant & helpful. Decided to check out this storage facility since I was moving in with the fiance for awhile. The staff is friendly and helpful with everything. Great location and easy to access during the gate hours. Very reasonable rates and they have dolly/flatbeds to help move stuff in. The only minor gripe I had was the hard sale on the insurance they "require" you to get when signing up. When you read the agreement it even states that it is not required and is optional. Overall very please with my experience and the staff at this location. Highly recommended. Love this place. The number one reason is I feel completely safe going in by myself. Knowing that a person is being monitored and the units are monitored also means my things are safe and I am safe. Very nice people running this facility as well. I would recommend this storage facility to all my friends. Since the beginning, I have appreciated the assistance I've received from the Extra Space Storage employees. They have instilled in me faith that my belongs are secure in their facility. They have solved any problems that have arisen in an efficient and apologetic manner. For example, after a system update, my unit had somehow reverted to its previous owner so my code was not working to let me it. While this was frustrating on Saturday evening when I could not get in to my storage, the folks in the office of the North Seattle location, promptly resolved the issue Monday morning. The process of signing up for the unit was quick and painless. It's a good deal for the value. I hope it stays this way. While I can't say that I have used any other storage facilities, I was very impressed with the quality of the customer service. They went out of their way to make my "move-in" easy. Even little stuff, like suggesting a sandwich shop that delivered to their site made my day easier. They had a few minor problems with their security system that day, but I would recommend this site highly for their quality staff. Vincent and his wife are the on-site managers at the Shoreline WA property, and they are really helpful. The facility is totally secrured and very clean. 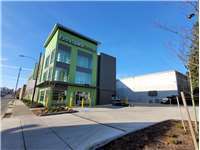 This is a great A+++ storage facility in the heart of Seattle - convenient, safe, secure, clean,temperature controlled, spacious, bright, 24/7, great management, wide docking area, organized, reasonable prices. All my friends who have seen the storage facility just swoon over about its great features. So happy that you are in the area. Definite will recommend to people who need storage area. I had an excellent experience with the "Extra Space" Storage facility. It was secure, clean and bright and easy to navigate. The units are affordable along with a variety of packing materials if needed. I urge anyone in need of a Storage facility to get online or go see personally what "Extra Space" Storage can do for you. The very best managers in the business. They try very hard to keep their customers in good standings and are more than happy to help when they can. I guess you get what you pay for. The managers at this Seattle location are the most wonderful people you will ever meet. Helpful, kind and caring. The facility is always spotless and I feel the security is above average. Before my son and I chose Extra Space, we shopped around online and by asking friends and family about their experiences. By far, this facility beats out any competition. The staff is amazing and the three of them are a great team. I would recommend this facility to anyone who needs storage and have done so. Thanks for having such a great place to store my stuff! Great facility, very secure -- but the rates have almost doubled in the last five years. This facility is convenient, well maintained and has very friendly office staff. We have been very happy with this facility. I've been storing my prized possessions with Extra Space Storage for quite some time. I decided on this facility because we were already trusting them with our store products. I appreciate the friendly staffing - they always have a smile and they are so accommodating. I never feel that I have to worry about my things. Access is easy and very convenient. I wish all storage facilities offered such great service and peace of mind! Thank you! Extra space made it so easy for us to secure the unit we needed for our move across town. We had a small baby at the time and you only have so many hands & time to decide what to do with all your stuff you when you move, so we just needed everything to come together quick and easy. The contract was easy to understand thanks to the great managment who went over everything with us quickly -- It wasn't like buying a car! We were in and out and got on with our business. We had shopped around for the best price and location & Extra Space cost a little bit more, but now that we've been renting here for over a year, we still agree the few dollars more is worth our piece of mind, that our belongings are safe. Each time I need to go get something, or drop something else off in my unit - it's a plesant stop for me. Thanks Extra Space! I did some extensive comparative shopping before deciding to go with Extra Space in north Seattle. These are the cleanest and safest storage units around, and the staff is very nice and helpful. Other nearby places I checked out screamed "danger" for a woman needing to use a storage unit late at night. Extra Space is well-lit, very safe, and exceptionally clean. I am very happy there. Had a great experience and the sales representative were very helpful on answering all the questions. Will definitely store my stuff here or use their service in the future again. This facility was originally chosen because it offered after-hours access, which is crucial for our small business. We've never had cause to regret our choice! It's always clean, regular maintenance is done in a timely way, there's plenty of advance notice when a big maintenance project will occur, and it has a dynamo on-site staff! I am greatful to have the management in staff in place where I store my goods. They remember my name and will contact me if anything seems amiss (such as forgetting to lock up) and are just always pleasant and helpful. The facility is clean, well maintained and most importantly secure. The place is clean. The building is secure. There are always four wheel trolley cars available. The temperature in the building is always tight. Even the bathrooms are clean. The managers who staff the office and live on site are polite, competent, helpful and professional. Our experience has been so good in fact, that we've recommended this facility to friends and family; and when we needed a storage unit in another state, we looked for and found a property managed by the same company. I chose Extra Space primarily because it is conveniently located near my home. Therefore, I only compared to 4 other facilities and can't speak to what can be found in other parts of town. This is one of the cleanest storage places I have seen, and it is well constructed (concrete and steel). My only qualm is with the bolts that close the unit doors. Even with a good lock, it would not be too hard cut through the mechanism. Not that I expect trouble, but some of it comes down to the general sense of security one gets. The people who work at this facility are friendly and accommodating. It definitely appears well run and I think they take pride in their place. Unfortunately, the computer system they have to work with is slow and sometimes fails. As a result, signing up as a new customer is a bit painful, and you cannot count on getting electronic reminder notices. If you're looking for a storage unit, this is the place to go. The staff was wonderful to work with. Vincent and Misty were pleasant and they answered all my questions. When I first emailed them for a quote, I was very surprised to hear back from Misty over the phone within a short amount of time. I commend them for their excellent customer service!! Convenient; very friendly interactions; 24 hour availability; clean; neat; and easy access/parking. Coming from Aurora/Highway 99 exit off Aurora/Highway and go east 1 1/2 blocks toward I-5.